In a Brazilian lagoon, dolphins that don't cooperate with people must range farther to find food. Carolina Bezamat, Universidade Federal de Santa Catarina, Brazil. (Inside Science) -- On the beaches of Laguna, Brazil, the local artisanal fishers refer to their aquatic helpers as "good dolphins." 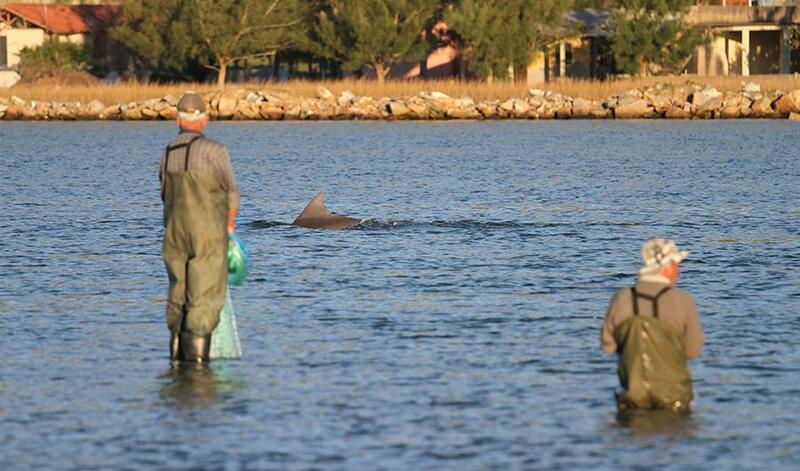 It's almost always the same 10 to 20 dolphins that come herd fish to where the men wait in a line with their nets. But the other 30 or so dolphins that live in and around the lagoon, known to the fishers as "bad dolphins," might cooperate too if only they could. New research suggests that for the bottlenose dolphins in Laguna, human fishers may be a desirable but limited resource, and "good dolphins" are simply the best at hogging access. "It looks like they're dominating the best spots," said Mauricio Cantor, a postdoctoral researcher at the Federal University of Santa Catarina in Brazil. "There's competition on the dolphin side as well, in the same way that there is competition on the fisherman side." Laguna is one of only three or four locations in the world where such human-dolphin cooperation is known to occur. The fishers watch for the approaching dorsal fins of dolphins herding in schools of fish, then cast their nets in response to signals such as a tail slapped against the water. Researchers suspect that the nets break up fishes' defensive schools, disorienting the fish and making them easier for dolphins to catch, said Cantor. The fishers clearly benefit too, and they feel deep fondness for their dolphin partners. Cantor recalls seeing the older fishers weep when they learned of the death of a local favorite, a male dolphin named Mandalao, whom some of the fishers had known for 30 years. In the new study published in the May issue of the journal Animal Behaviour, Cantor and his colleagues mapped out where different dolphins in the population spend their time. Interactions between dolphins and fishers occur at five sites, and the researchers documented sightings at these sites and elsewhere around the lagoon, identifying individual dolphins by scars and other marks on their dorsal fins. As expected, the dolphins mostly fell into two groups: cooperators, which spent most of their time hunting with human fishers, and noncooperators, which hunted on their own or with other dolphins and rarely interacted with humans. The researchers also saw that cooperators tended to stay near the sites with the fishers, while noncooperators roamed much farther afield. This suggests that fishers provide a rich buffet, allowing cooperator dolphins to laze around rather than traveling in search of food. "It's like living in front of your favorite restaurant that is open 24/7," said Cantor. Why don't all the dolphins take advantage of the fisher buffet? Working with fishers is a skill that dolphins must learn through practice and observation, and it may be that not all the dolphins know how to do it, said Cantor. But in addition to such limitations, it seems that there is only room for a few dolphins to work with fishers at a time. The number of dolphins that regularly cooperate with fishers has been stable for decades, even as individual dolphins have died and been replaced. And while it is difficult to observe aggressive interactions between dolphins in the murky water, the researchers have noted a few occasions when dolphins seemed to be defending fishing sites from one another, said Cantor. The researchers also sometimes see one dolphin or a pair of dolphins move into a cooperative fishing site as soon as another group leaves. Hal Whitehead, a whale and dolphin researcher at Dalhousie University in Halifax, Nova Scotia, who was not involved in the research, said it makes sense that the dolphins would be competing for access to fishers. "As biologists, we expect competition to be very omnipresent," he said. To Whitehead, the findings emphasize the importance of considering animals as individuals, each with their own personalities, experiences and strategies. Even within the small Laguna population, there are at least two dolphin lifestyles: roaming the sea with other dolphins, or staying nearby and working with humans. On even closer inspection, said Whitehead, the dolphins' lives would likely seem even more varied and complex.